"There is a national problem finding enough intensivists to support an ICU," said Dr. Glen Bouder, director of valley intensivists at Valley Health and medical director of critical care at Winchester Medical Center. "We struggled with that obstacle at the same time that we were growing the ICU program volume," he said. "We asked ourselves, 'How do we grow our program, support our existing physicians and still meet the care needs of our community?'" "Not many organizations have the bandwidth to have the APACHE – Acute Physiology and Chronic Health Evaluation – scoring system, or have a robust acuity-based infrastructure in order to understand what is actually going on clinically in the ICU," Bouder said. "We all say, 'Well, our patients are really sick,' but how do you validate that?" From Bouder's perspective as an ICU director, there was a clear added advantage to have those quality measures and acuity-based measures available to see how the organization was doing and to benchmark the organization for quality improvement. Valley Health could have tried to keep riding out the intensivist shortage by hiring locums, which is very expensive. However, the health system's Winchester Medical Center hospital president Skip Phillips had previous experience with tele-ICU, specifically, telemedicine technology and services vendor Advanced ICU Care. Based on Phillips' familiarity with the model, he encouraged Bouder and his team to explore tele-ICU services as a potential solution to some of the health system's most pressing challenges. "Advanced ICU Care impressed us with their breadth of clinical experience," Bouder said. "They have a strong history of working in different hospital settings and with facilities of various sizes and complexities. It inspired confidence that they knew what they were doing in terms of being able to help us." The other value proposition with the telemedicine vendor, in addition to the physician support they provided, was the nursing component of their service offering, he added. The strength of the vendor's nursing staff and their ability to support Valley Health nursing staff, in addition to the intensivist team, was an added appeal to Bouder. In fact, it was something he had not previously thought about. "Integrating the tele-ICU technology with our Epic EHR platform went very well, and the vendor's depth of experience really helped the launch," Bouder explained. "The technology elements are the largest portion of the implementation process in terms of time and energy, such as getting all the hardware and software integration done." "Winchester Medical Center has a very good technical foundation in place that allowed us to get operational very quickly." "There is an art to working through that and preparing people for tele-ICU," he said. "An administrative decision to implement tele-ICU without engaging the staff risks a lack of buy-in and success. One of the things we did upfront was take a group of our nurses, many of whom were skeptics, on a site visit to a facility that was similar in size and scope to our hospital." "After the first six months of tele-ICU, ICU length of stays actually got even shorter as we were able to reduce them by 34 percent," Bouder said. "This told me that there were active care interventions taking place, particularly at night, that were now getting patients out of the ICU faster. Certainly, reducing length of stay was a pleasant surprise." "For example, blood transfusions and glycemic control, both of which we thought were going well, were actually not up to standard," he said. "Last year we focused on improving glycemic control and we saw around a 24 percent improvement in our glycemic control, which landed us just below the Advanced ICU Care average measured against all of their hospitals." "We then started to see improvements in those metrics over time," he said. "It is very helpful to have an understanding of your ICU strengths and weaknesses. No one wants their ICU to be the low performer relative to your peers." "In terms of patient experience and acceptance of tele-ICU, I would say their introduction to the care model came with an appropriate dose of healthy skepticism," Bouder reported. "But we did a lot of education upfront, for example having informational brochures in our waiting rooms, and introducing Advanced ICU Care tele-intensivists as part of our team." Most patients are used to technology like FaceTime so the concept isn't completely foreign to them, Bouder added. 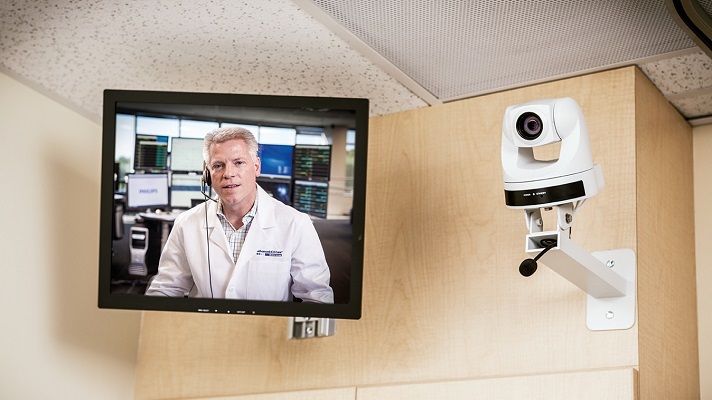 "You really need to avoid underestimating the importance of getting all the caregivers, physicians and nurses and respiratory therapists, to buy into tele-ICU," Bouder advised. "Otherwise, you will not achieve the goals you desire. This includes upfront communication about the program, managing of expectations, a level of necessary education, and a rapid back-end process to resolve issues – this can make or break a program." It also is important to look at one's IT infrastructure to make sure it can support tele-ICU. "Winchester Medical Center has a very good technical foundation in place that allowed us to get operational very quickly," he said. "For example, we were up and running in four months. We could not have done that without a strong IT infrastructure." "We did a number of presentations and a lot of education for both the critical care committee and staff executive committee to get them on board," he said. "And finally, we really emphasized with the ICU staff that tele-ICU was in no means replacing them but rather supporting them as part of our ICU care team. Getting that mindset was key, for the current intensivists as well as the nursing staff and the rest of the care team."